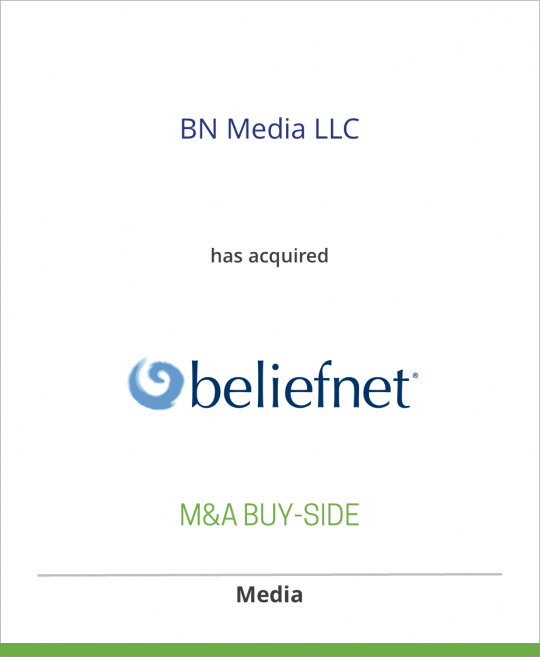 BN Media, an entity that includes the investors behind Cross Bridge and Affinity4 has acquired Beliefnet from News Corporation. DeSilva+Phillips, LLC, a leading merger and acquisition advisor to the media, communications and digital technology industries, reported that it managed the recent acquisition of Beliefnet, the Web’s leading multi-faith inspiration and spirituality site, by BN Media, an entity that includes the investors behind Cross Bridge and Affinity4, from News Corporation. The high profile acquisition reflects DeSilva+Phillips’ prominence in media/communications industry transactions. The firm specializes in providing its M&A advisory and management services. The acquisition builds on an existing relationship between Beliefnet and Affinity4, an affinity marketer that specializes in helping charities, ministries and other nonprofit organizations raise funds. DeSilva+Phillips, Mediabankers™, is a New York-based investment bank that advises dealmakers in every area of the media, information and related technology markets. DeSilva+Phillips provides M&A advisory and corporate restructuring services and private placements of debt and equity, and has completed more than 210 transactions since 1996. Its broker-dealer affiliate, DeSilva+Phillips Corporate Finance LLC, is a member of FINRA and SIPC. The mission of BN Media is to serve the vast online market for spirituality and inspiration, bringing audio-visual and written content to the masses while helping people make a difference for their favorite nonprofit organization. BN Media achieves this by bridging the gap through which ordinary activities inspire activism, online giving and volunteerism. Cross Bridge continues to expand its base of prominent nonprofits that are using the site www.crossbridge.com to convey their content, some of which has been displayed on a number of robust distribution sites. Cross Bridge offers video content from groups such as Billy Graham Evangelistic Association, Bowery Mission, Daystar Television, Food for the Hungry International, Guideposts Magazine, and Bishop T.D. Jakes. The website is also growing its list of advertisers who see an opportunity to benefit by aligning with the positive values that Cross Bridge promotes. Affinity4 is an affinity-based marketing company that helps to support the goals of nonprofits by assisting in their fundraising. Specifically, Affinity4 markets various telecommunications products and services, including long distance and wireless phone services, high-speed Internet, as well as DIRECTV®, credit card and insurance to individuals who have selected to support charities, ministries and other nonprofits. With each supporter’s purchase, Affinity4 provides a 10% GiveBack to the corresponding nonprofit organization. Affinity4’s business model is to leverage and transform ordinary activities such as making phone calls or watching TV into fundraising opportunities on behalf of vital causes worldwide. The Affinity4 Brand Promise is Ordinary Activities. Extraordinary Giving. To date, Affinity4 has given back more than $76 million to nonprofits. For more information, visit: www.affinity4.com or call 1-800-684-4880. Beliefnet, a recipient of the National Magazine Award for General Excellence Online, is the largest multi-faith online community for spirituality and inspiration. Its mission is to help people find and walk a spiritual path that instills comfort, hope, clarity, strength and happiness for people who are exploring their own faith or curious about others. Beliefnet is the definitive source of spiritual information presented without defined editorial point-of-view, and is a leading authority for major news organizations in the United States. It covers an exhaustive range of topics and is continually enhanced by its users. Resources include blogs and social networking tools, feature articles and videos, quizzes, devotionals, photo galleries and interviews with noted politicians, celebrities and spiritual leaders. Beliefnet has more than 14 million newsletter subscribers and averages nearly three million unique visitors per month. Beliefnet is not affiliated with any spiritual organization or movement, and has partnerships with The Wall Street Journal and Chicken Soup for the Soul, among others.